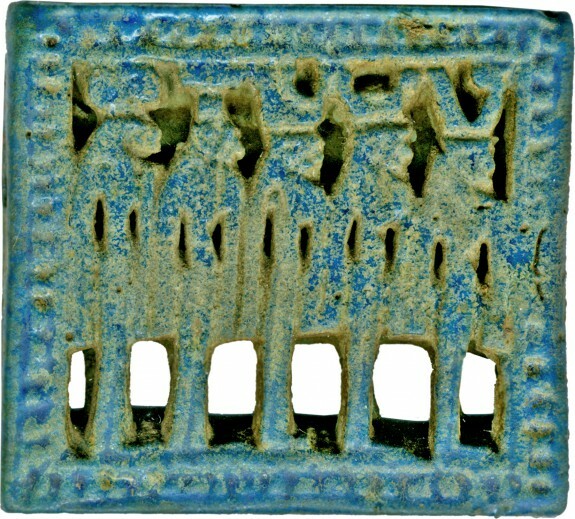 Description This large openwork bead made of blue faience has on either side five different goddesses, each identified by a headdress. The hollow space between suggests the two sides of the plaque were made in identical moulds and joined before firing. Perforated lengthwise. Jewelry - Ancient to Modern. The Walters Art Gallery, Baltimore. 1979-1980. Provenance Henry Walters, Baltimore [date and mode of acquisition unknown]; Walters Art Museum, 1931, by bequest.